Kate lived in San Francisco before making Idaho her new home. She's an athletic and energetic girl who enjoys good food and cooking. Her beautiful kitchen is perfect for entertaining friends and family and cooking up wonderful meals, like this amazing dessert. "Cooking is one of the ways that I can express myself, it's my way of showing people that I care," says Kate. "I must have that from my dad, he loves to bake and is very good at it. For Idaho's Melting Pot, I chose to make sticky toffee pudding because it's one of my favorite English desserts. I have fond memories of sharing it with my grandma Nancy, who is 96 years old and still lives in England. It's her favorite, too." 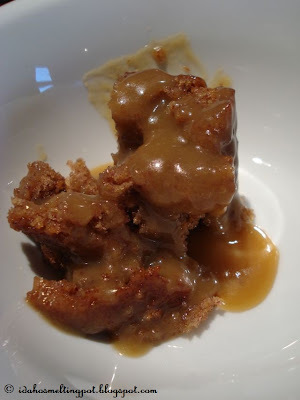 Sticky toffee pudding, a delicious combination of soft and moist date cake soaked in sweet, gooey caramel sauce, is a fairly recent newcomer to the English dessert table. It's considered traditional "pub food" and shares the list with bangers and mash, fish and chips or cottage pie. "The English tend to have a sweet tooth. This dessert has quickly become England's top choice for comfort food. After working hard all day in the office, I'd go to the pub with my coworkers to have a drink, a bite to eat for dinner and sticky toffee pudding for dessert. It was something we would all look forward to!" says Kate, while she stirs the toffee sauce. The recipe she uses for the cake is adapted from Joyce Hickey's Sticky Toffee Pudding recipe, as featured in the British cookbook published by the local chapter of the Daughters of the British Empire, an organization that Kate is actively involved in. 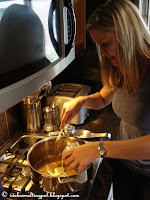 The caramel, or toffee sauce, is Kate's own recipe. 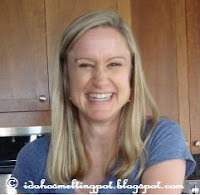 "I love living in Idaho", Kate smiles, "but I also miss my family in England. If I could choose, I'd live right in between the two countries and have the best of both worlds!" Preheat the oven to 325F. Butter a 9-inch baking pan. Add the dates and the water to a saucepan, bring to a boil and simmer for ten minutes, or until the dates are soft. Set aside and cool. 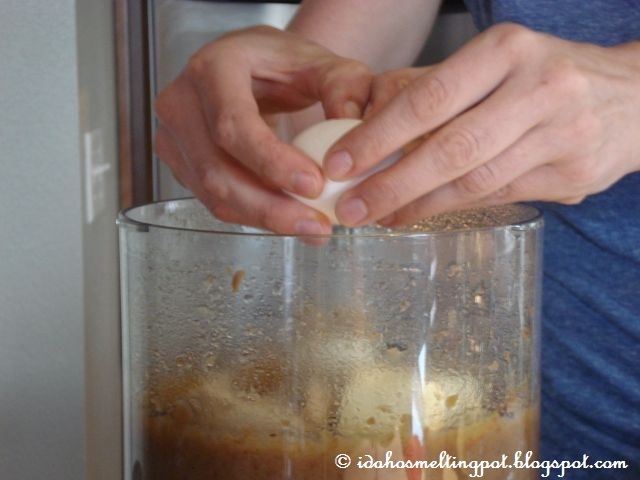 When they have cooled down, process them with a stick blender or a food processor into a moist, liquid paste. In the meantime, mix the flour, the baking powder and the baking soda in a separate bowl. Set aside. Mix the butter, the sugar, the eggs and the flour mixture together into a cohesive batter and add the flour. Mix until blended but don't overmix. Pour the batter into a buttered 9-inch pan and bake for about 45 minutes, or until the cake is done. Let the cake cool in the pan for about ten minutes, then carefully invert onto a rack. Pour 1/3 of the warm caramel sauce into the bottom of the pan, place the cake on top and pour 1/3 slowly over the cake. Let it soak for about five minutes, then slowly add more sauce, one ladle at a time. Cut into squares and serve warm. Melt the butter and sugar slowly in a pan, carefully add the evaporated milk while stirring (the sauce scorches easily) until a beautiful golden brown sauce emerges. Take the sauce off the stove, and stir in the vanilla extract. Taste. If the sauce is too thick (it should coat the back of a spoon lightly), add a little bit more evaporated milk.